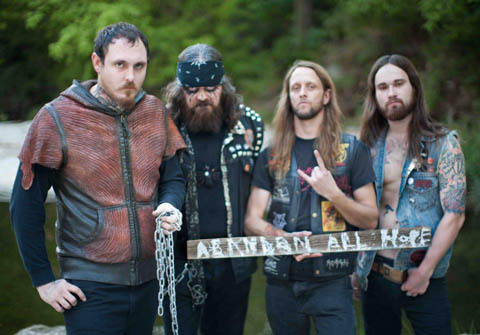 The Texas-based acoustic rock act ANCIENT VVISDOM have just been confirmed for a tour alongside blackened-prog stalwarts Enslaved on their "Winter Rites 2013" tour, which also features doom metallers Pallbearer. The three-week tour, which starts on Jan. 30th in Philadelphia, will be the band's first performances in support of their new album, "Deathlike," which will be released on Feb. 5, 2013. More details about "Deathlike," the follow-up to their 2011 critically acclaimed debut release "A Godlike Inferno," will be revealed in the near future. ANCIENT VVISDOM, which consists of singer/songwriter Nathan Opposition, his brother Michael Jochum (electric guitar) and acoustic guitarist Justin "Ribs" Mason, were seen earlier this year touring the U.S. as openers for Ghost's headlining tour. From there, the band toured overseas in response to their nominations for "Best Underground Band" at Metal Hammer's Golden Gods Awards and "Best New Band" at the annual Classic Rock awards, a trek that also saw them perform at Norway's Inferno Festival, the prestigious Roadburn Festival in Holland, and live on BBC Radio.